Robin Pacific Artist, writer and Spiritual Director. Currently working on a series of art projects with, and in support of, garment workers in Bangladesh. A couple of years ago I sewed 300 men's ties together and painted them black. This was for an installation called "A Black Tie Affair" at Nuit Blanche in Toronto. The "curtain" of ties hung on the ceiling and cascaded down to the floor, where I had placed 18 gold leafed ceramic bowls filled with red liquid. All night, singers sat on a chaise lounge and performed. As the night wore on, the singers grew older. The first was an 11-year-old girl, the last was a woman in her 60s. Like all women of my generation, I learned to sew in junior high school Home Ec. class, as it was called, and as a university student I sewed all my own clothes. This was before the era of cheap, disposable "fast fashion," when you actually saved a lot of money by sewing your own wardrobe. I remember a long-sleeved, pale apple green linen mini dress I made, which I wore with red patent t-strap flats, sashaying down Saint Catherine Street in Montreal. I could whip up a cute a-line skirt in the evening and wear it to class in the morning. Those sewing projects were challenging, creative and fun. Sewing the ties, however, was a rote task. I could only work, at most, four hours at a time, before my shoulders and neck knotted up, and my eyes grew sore and my vision blurry. It was mentally taxing as well -- although in one sense it was "mindless," I had to concentrate every second. Feeding the ties through the machine required careful attention, or the whole thing would bunch up and I'd have to rip it out and start over. So when I started thinking about doing a series of art projects around the issue of garment workers in Bangladesh, I imagined that sewing piece work for 10 to 12 hours at a stretch, would be soul-destroying, physically demanding and mentally exhausting work. But when I actually sat down and had, with the help of an interpreter, one-on-one conversations with almost forty garment workers in Dhaka, I was surprised to learn that they, one and all, took great pride and enjoyment in their work. I started off by asking what they did, the answer would be "pockets," or "waistbands," or "sleeves." When I asked if they liked their work, they always said yes, and many said they loved it, faces alight at the question. The Bangladesh garment industry employs an estimated four to five million people. The majority are young women, who have usually come from villages where they are often married off as child brides (the bride price increases with age) and always live in desperate poverty. 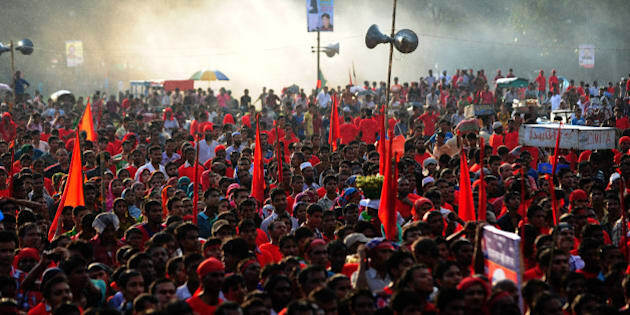 In Dhaka and other big production centres, they have a measure of economic autonomy, often the sole support of their families. They want to keep their jobs. They want us to keep buying the clothes they make. They have never called for a boycott. What they want to change is their poor wages (as low as $68 U.S. a month), and despicably unsafe working conditions. They are routinely spit on, sworn at, and, when they try to organize a union, often brutally beaten, usually fired. Exit doors are locked so that they can't go to the bathroom, and this is what has caused over 800 deaths by fire in 2013 alone. The Rana Plaza building collapse in April of 2013 killed 1,129 people and wounded and traumatized 2,500 more. When I asked one young worker what message she would like me to take back to Canada. She said, "we just want people to know that we want to have our rice and dal at the end of the day, and to eat it in peace." I read somewhere that if wages were doubled, it would increase the sticker price of that $12 t-shirt we just have to have, by only two per cent (something I plan to research more thoroughly). Wouldn't we all be willing to pay that little bit extra if we knew that the people making our clothes were paid decently and treated humanely? That they weren't dying in fires and being crushed to death in building collapses? And thus was born The FAST Campaign a series of art projects leading to consumer activism -- a demand for a FAIR living wage; ADULT labour only, SAFE working conditions, and no unpaid over-TIME.